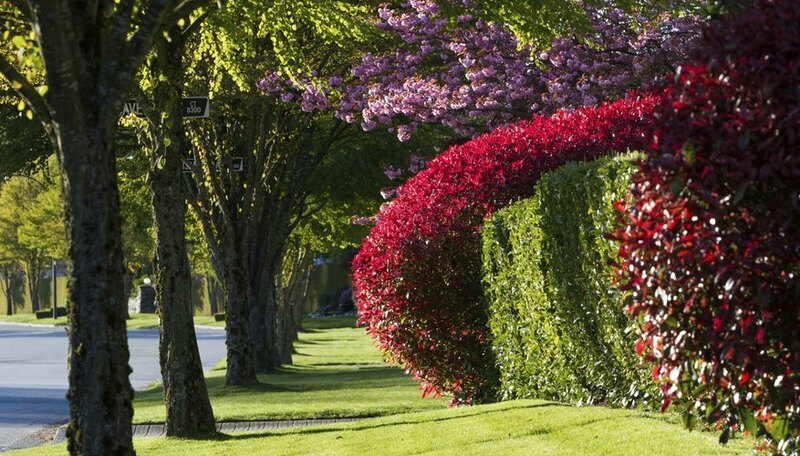 With their shiny, evergreen leaves and large, dense growth habit, photinias (Photinia spp.) are often used as hedging or screen plants. Garden favorite, red tip photinia (Photinia × fraseri) produces dramatic, bright red new growth. Photinias are notoriously susceptible to leaf spot disease, particularly in the southern U.S., and may also fall prey to common diseases including fire blight and powdery mildew. Proper care is vital in preventing disease. Entomosporium leaf spot is a fungal disease that causes small red spots on leaves that gradually enlarge to become maroon blotches. Heavily diseased leaves drop off, weakening the shrub. Entomosporium leaf spot can kill the shrub over several years, particularly if compounded with other problems. To lessen the amount of fungus around the shrub, rake up and destroy dropped leaves and apply a fresh, 2-inch layer of mulch. Avoid pruning during the growing season, as new growth is particularly vulnerable. Prune in winter, when the shrub is dormant. Powdery mildew is a fungal disease that causes masses of fuzzy white or grayish spores to form on plant foliage. The disease can be combated by applying 70 percent neem oil to the entire shrub. Thoroughly mix 2 tablespoons of oil in 1 gallon of water and apply with a hand sprayer, evenly coating the leaves on the tops and undersides. Shake the sprayer back and forth to keep the contents mixed. Apply every 10 to 14 days until the disease is gone. Do not apply when bees are active around the plant. Protect yourself by wearing long sleeves, pants and gloves, and store the oil out of reach of children and pets. A bacterial disease, fire blight primarily occurs during warm, wet weather. The disease causes dead patches on branches, known as cankers, that begin to ooze and leave watery stains and streaks. New shoots may also wilt and blacken. Treat canker by pruning and destroying infected branches. To avoid spreading the disease to healthy plant material, disinfect your pruning shears by dipping them in a solution of 10 percent bleach and 90 percent water in between cuts. To prevent diseases, provide your photinia with suitable growing conditions. Red tip photinia grows in U.S. Department of Agriculture plant hardiness zones 7 through 9, where it will grow in partial to full sunl. Though it can grow in full shade, the shrub is more susceptible to leaf spot disease in shade. Plant in a well-draining soil that is moist, but not waterlogged or flooded. Thin out the shrub with a light pruning in winter to encourage air circulation, which helps prevent disease.